Help Tolfdir find his missing alembic. Hunt down his missing alembic in the College. Tolfdir is an elderly mage and professor at the College of Winterhold and one of the first people encountered at the college. When you have completed Under Saarthal and have begun Hitting the Books Tolfdir will be residing at the college. If you run across him looking confused, ask him if he needs help. On the top floor: in the northern room, on top of a barrel to the right of the central dining bench. On the top floor: underneath the left display case in the enchanting room. On the bottom floor: on a crate in the eastern room, with the big barrel in it. However, even without the quest being activated, you will run across the alembic numerous times in your wanderings about the college. Simply return the alembic to Tolfdir when you speak to him, and earn the reward each time. Tolfdir will give you thirty gold and an empty petty, lesser or common soul gem for returning his misplaced property. Finding Tolfdir's Alembic before triggering the quest will not change the quest dialogue or outcome; you can simply start the quest and give the alembic to Tolfdir to receive your reward. 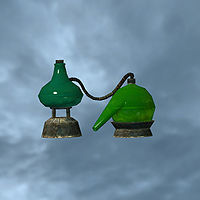 Unlike other games where alembics are a major part of Alchemy, this is the only alembic item found in Skyrim (in Skyrim, all alchemy equipment is permanently attached to alchemy stations). USKP version only: Finding Tolfdir's alembic before triggering the quest may cause the objective to remain in your journal and not be set as complete. Tolfdir may offer the dialogue option that initiates the quest after it has already been completed. Selecting this option will re-add the quest to your journal, but the Alembic will not respawn, leaving the objective permanently stuck in your journal. Entering the console command player.additem "00026c31" 1 to give yourself a second alembic will allow you to complete the quest by speaking to Tolfdir as normal. On the PC, it is possible to use the console to advance through the quest by entering setstage MGR01 stage, where stage is the number of the stage you wish to complete. It is not possible to un-complete (i.e. go back) quest stages, but it is possible to clear all stages of the quest using resetquest MGR01. This page was last modified on 12 January 2019, at 04:24.